An artist’s illustration shows Sidewalk Labs’s Quayside redevelopment of the Toronto waterfront. 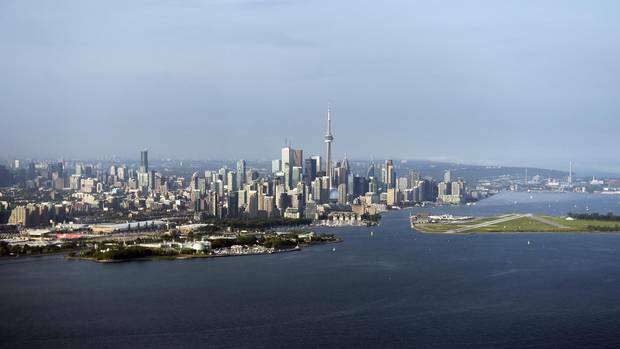 A unit of Google's parent company, devoted to urban innovation, has signed a deal to map out a new kind of neighbourhood on Toronto's waterfront that could demonstrate how data-driven technology can improve the quality of city life. 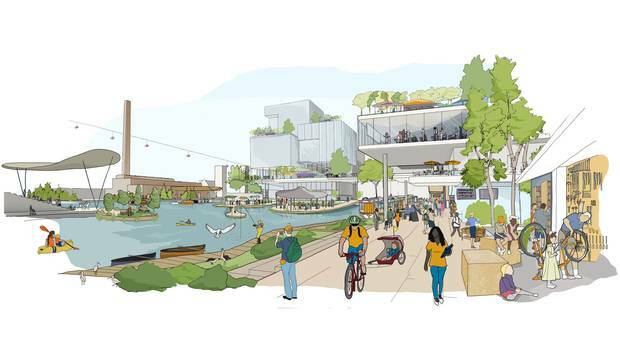 On Tuesday, Sidewalk Labs, a division of Alphabet Inc., and the government agency Waterfront Toronto announced a partnership in which Sidewalk initially will invest $50-million (U.S.) in a year-long planning process for Quayside, a 12-acre district on the waterfront, and the company has signalled its intentions to pursue a much larger area. This is the first such project for Alphabet, and for Sidewalk Labs. If the initiative proceeds, it would include at least 3.3 million square feet of residential, office and commercial space, including a new headquarters for Google Canada, in a district that would be a test bed for the combination of technology and urbanism. "Sidewalk Toronto" would represent North America's largest example of the smart city, an urban district that is built around information technology and uses data – about traffic, noise, air quality and the performance of systems including trash bins and the electrical grid – to guide its operation. Access to those systems and the use of that data, in this private-public partnership, will raise novel policy questions for governments about privacy and governance. Officials on hand for the announcement included Prime Minister Justin Trudeau, Ontario Premier Kathleen Wynne, Toronto Mayor John Tory and Alphabet executive chairman Eric Schmidt. Mr. Tory hailed the announcement as a step toward creating "a global hub for urban innovation" in Toronto. "This is a moment for Toronto," he said in an interview in advance of the announcement. "By having Sidewalk interested in coming here, we're building up our credentials as the place to be in the world." The Quayside development would be the first step in a larger, 750-acre redevelopment. Sidewalk's initial ideas – in a 220-page document made public Tuesday – show the company with an agenda that represents significant innovation in architecture, construction and urban design. 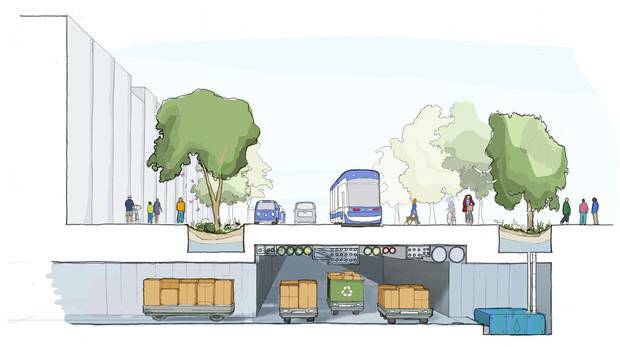 Within the area it develops, private cars would be banned; streets would be served by autonomous vehicles and freight robots moving in underground tunnels. Intelligent signals would manage traffic on pedestrian-friendly streets; buildings would be designed to be highly flexible, constructed using modular units that are produced nearby. These would be home to what Sidewalk describes as a "radical" mix of offices, retail, residence and maker spaces, a blend which would challenge existing zoning and building-code regulations. Those buildings would be linked by an energy system that would reduce the district's energy consumption by 95 per cent below city regulations. And a digital layer would measure movements of people, energy, traffic and goods through the district. In a video conference last week, Sidewalk Labs CEO Daniel Doctoroff – who also attended Tuesday's announcement in Toronto – explained the company's aim: "We believe that by … leveraging technology and combining it with really smart, people-centric urban planning, we could have really dramatic impacts on quality of life," he said. "But you need to do it in a place – ideally a place large enough to be a laboratory for an integrated approach to innovation and planning." That place, in 2017, is in Toronto. 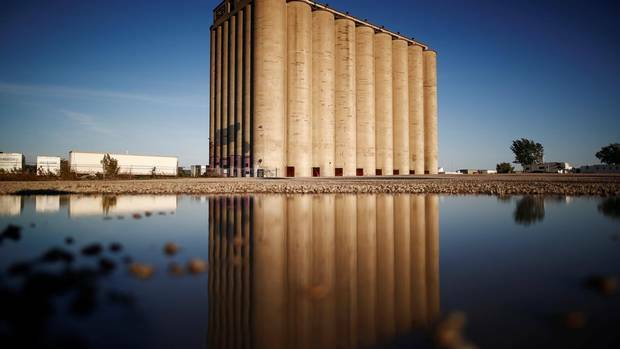 Quayside would be the first step toward a larger project: the development of 750 acres of the surrounding area newly made possible by a $1.185-billion flood-protection program announced in June. 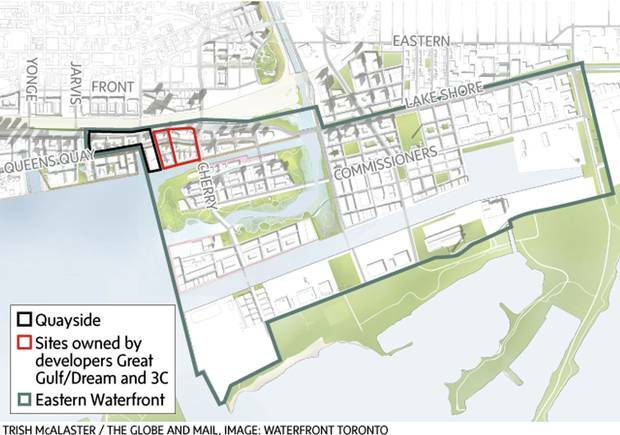 Waterfront Toronto – an agency controlled by city, provincial and federal governments and tasked with redeveloping 2,000 acres of brownfield land in and around the city's old port – aspires to "use the waterfront as a test bed," CEO Will Fleissig said last week. "In this area, we couldn't just build more condos. We want to explore new ideas, new innovations, new partnerships that if successful could apply to the rest of Toronto, other cities in Canada and potentially across the planet." An aerial view of what the Toronto waterfront area looks like now. The Globe and Mail’s dark blue building is visible at right. Unlike the case of Amazon, which is now soliciting bids from American and Canadian cities for its new "HQ2," Sidewalk Labs is coming at the invitation of government. It responded to a March, 2017, call from Waterfront Toronto for a partner to develop the Quayside site; the agency asked for a partner on a "globally significant community" that would be climate-positive and support innovation in building and technology, while also addressing social goals including affordable housing. Sidewalk's proposal is full of ambitious and even radical suggestions (see sidebar below). It promises "the chance to demonstrate how emerging technologies can make cities more affordable, easier to travel within, and more environmentally sustainable." Sidewalk's business model is not yet clear. Mr. Doctoroff said the development "primarily is a real-estate play." Many of Sidewalk's executives share a common background in the data-driven administration of former New York mayor Michael Bloomberg and at the financial information and media company he founded, Bloomberg LP. Mr. Doctoroff was Mr. Bloomberg's deputy mayor; among his most visible efforts was kicking off the development of Hudson Yards, a 28-acre, $20-billlion redevelopment over rail yards in Manhattan. (Sidewalk's headquarters are there.) Other Bloomberg veterans at Sidewalk include sustainability expert Rohit Aggarwal and head of development Josh Sirefman, who was later an executive at Brookfield Properties in New York. "We are lovers of cities, and many of us have spent our lives in the work of building cities," said Micah Lasher, Sidewalk's head of external affairs. "We are built to bridge the urbanist-technologist divide." 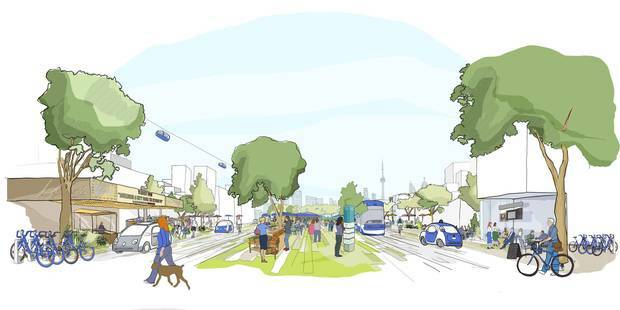 Read an opinion piece by Sidewalk Labs CEO Daniel Doctoroff, top, and Alphabet executive chairman Eric Schmidt on why they chose Toronto for their neighbourhood of the future. So far the company's most visible project has been LinkNYC, a set of kiosks on New York streets that provide WiFi and internet access along with advertising screens. As Sidewalk prepares for a much larger public-sector partnership in Toronto, the history and influence of its parent company raises questions. Like Facebook and Apple, Alphabet continues to make its headquarters on a closed suburban site, and prizes secrecy in its operations. Its primary business, Google, is based on collecting and monetizing private data. What would a private-public relationship look like? Sidewalk plans an "urban innovation institute" that would bring together academics, Sidewalk staff and outside developers. Sidewalk says its Toronto development would include a variety of sensors to "[collect] useful data about the urban environment." As examples, the company cites "hyperlocal weather" sensors, air-quality sensors, noise sensors – and cameras associated with artificial intelligence that can track the flow of traffic and, it says, "make use of dynamic signage, flexible street furniture and guidance from smartphone apps … to create better pedestrian flow." The access to those sensors would be open, Sidewalk says. However, this sort of collection and analysis of data across an entire community has rarely been attempted, and never by Sidewalk or in Canada; this will demand new regulation to control access to data and personal privacy. "This is the big frontier around smart cities," said Pamela Robinson, a professor at Ryerson University's School of Urban and Regional Planning who is researching data and smart cities. "Do proprietary relationships between corporations and governments make data more closed? Probably they do, but governments have made commitments to open data. So how does that get resolved?" The planning process for Quayside, which begins with a public meeting Nov. 1, will address that as a central question, Mr. Fleissig said. Likewise, if a company such as Sidewalk develops a device or process for use in a city, who owns the intellectual property? And what access do competitors or startups have to the platform? Sidewalk says it wants to make its "digital layer" widely accessible. "We see ourselves as an urban innovation platform," Mr. Doctoroff said. "We believe that our role is to create the conditions for others to innovate on top of. And that's what great cities have always done: A street grid is a platform. We don't think we're coming in with all the answers; we see it as a process, and together with the community and elected officials, we think we can create something really historic." 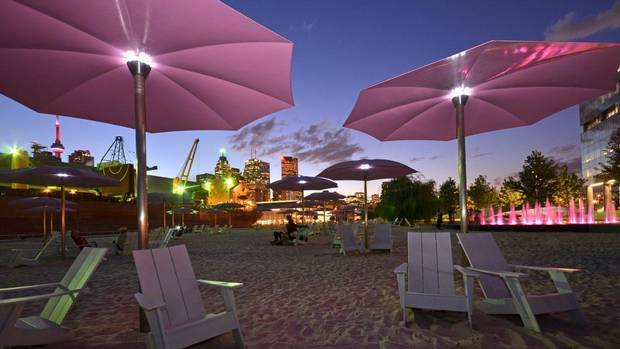 Mr. Flessig said that Waterfront Toronto is entering the deal with its eyes open to issues such as these. Sidewalk has made a firm commitment to fund the planning process, and at the end of a year, either party "has an off-ramp" to the process, Mr. Fleissig said; protecting privacy and creating opportunities for Canadian innovation are "firmly" among the goals, he said. The build-out of the site is likely to involve other partners. Sidewalk has already begun discussions with developers Great Gulf and Dream and a consortium called 3C, which together own approximately 20 acres adjacent to the Quayside site. Beyond that, "We are open to all sorts of partnerships," Mr. Serifman said. The agency gave serious consideration to a second bid that includes experienced real-estate developers. "There may be an opportunity, in time, to bring in some of the members of the other bid," Mr. Fleissig said. Mr. Fleissig and Waterfront Toronto staff would not comment on the identity of the other shortlisted bidders; however, The Globe and Mail has learned the consortium includes OMERS Ventures, Manulife Financial Corp. and Mattamy Homes, among other partners. There's no question that the Sidewalk proposal promises to shake up the worlds of planning, architecture, development and construction. "It will be disruptive, in the best sense," argues Ken Greenberg, a Toronto urban designer and architect who has been closely involved with the Toronto waterfront redevelopment – and who was part of an internal think tank that Sidewalk called to form its urban agenda. It "should make the city" – Toronto and others – "much more open to new ideas," Mr. Greenberg suggested. "And that's important at this moment in history. When the automobile arrived, it had all sorts of destructive effects on the city because we didn't treat it intentionally." Smart city technologies "are coming," he said, "and we can't stop them; this is a chance to be intentional about the way we adopt them, and see how they can best fit into a city designed for people." 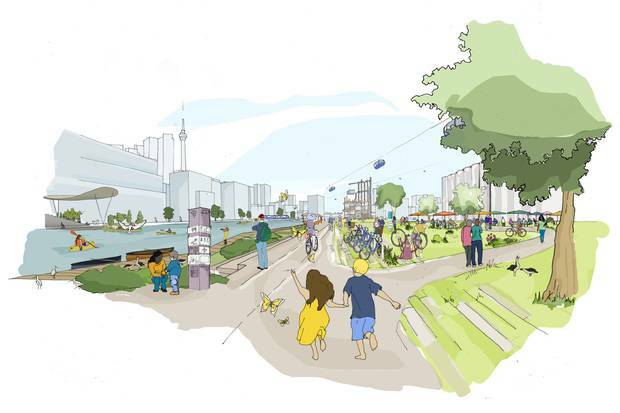 Sidewalk Labs has announced a partnership with Waterfront Toronto to plan a new neighbourhood on Toronto's waterfront, which will allow it to test technologies that could reshape how cities are built. The company released a 220-page document on Tuesday outlining some of its ambitions for buildings, streets and urban infrastructure – which range from familiar ideas to moonshots. Sidewalk proposes "taxibots" as the transportation backbone of the neighbourhood: small self-driving cars controlled by app-based services such as Waymo and Lyft. Larger self-driving buses would be the next larger scale – and the company proposes piloting that technology early in the project. Through an app developed by the Sidewalk company Flow, Sidewalk would "pilot a program that keeps parking prices high, but offers discounts to people who are coming from areas, or at times, when transit options are limited. Technology will enable pricing to vary in real time based on transit availability." Industrial robots, moving in an underground network of utility tunnels, would manage the collection of trash and recyclables. Underground tunnels let Quayside’s garbage robots and autonomous vehicles travel the area out of pedestrians’ way. With a concept they call "The Loft," Sidewalk aims to reinvent how buildings are constructed and divided. Like the manufacturing lofts of a century ago, these buildings would have a strong structure but their interiors would be designed around a standardized five-by-five-foot grid and standardized building components, allowing "ongoing and frequent interior changes." The way buildings are constructed and divided will be redesigned in Quayside. Sidewalk Toronto’s buildings would be modular units home to a mix of offices, retail, residences and maker spaces. 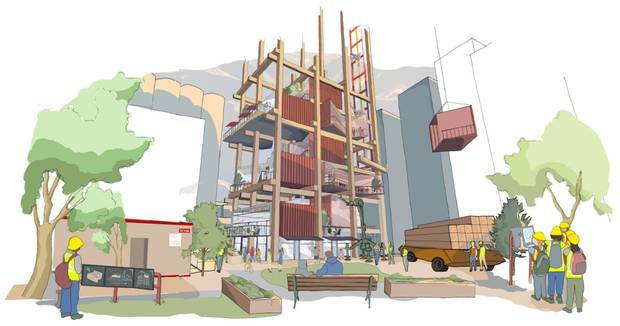 Sidewalk will pilot the construction of "tall wood," using new types of wood technology that allow for safe construction of large and tall buildings – a set of ideas that is already being explored by Canadian architects and builders. By arranging buildings carefully to produce comfortable microclimates – sheltered by canopies, protected from wind – the company suggests it can double the time in which it is comfortable to be outside in Toronto's climate. Sidewalk suggests that using building sensors could allow governments to loosen up use restrictions: If temperature, light, sound, structural integrity and other characteristics are constantly monitored by sensors, there will be no need for zoning as it exists today. This, Sidewalk says, would allow "radical mixed use" within buildings and neighbourhoods. Sidewalk proposes a heavily pedestrianized district; the company calls for narrow streets that privilege the pedestrian and "an intimate human scale." Three scales of streets – from large to very narrow – would serve increasingly private uses. Retail, including pop-up retail, would come and go within the spaces in the district's modular buildings. The streets would be pedestrian-friendly, with private cars banned in the area. Analysis: With Toronto, Alphabet looks to revolutionize city-building Sidewalk Labs hopes to use data to find solutions for how communities can be run more effectively, and whatever happens in Canada’s largest city may provide a blueprint for the rest of the world, Shane Dingman explains. 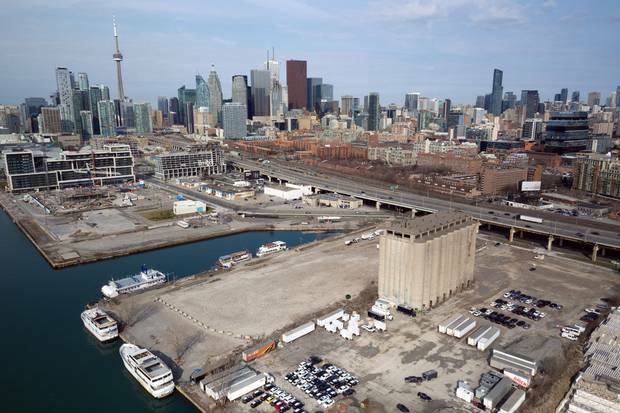 Shored up: How Toronto's waterfront redevelopment is going right Waterfront Toronto has become a political lightning rod, facing claims of overspending. But the real story is sunny, Alex Bozikovic writes. Waterfront of dreams Newcomer Will Fleissig wants to build a '21st-century city' and redefine how the GTA approaches Lake Ontario. It's a big dream. Will it float? Alex Bozikovic investigates. 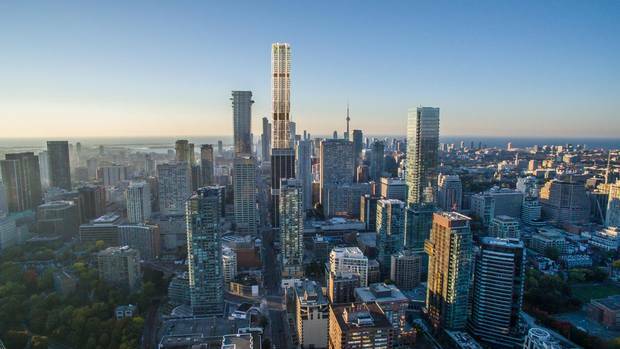 The One: An ambitious, 85-storey tower that will transform Toronto's skyline Designed by London’s Foster & Partners, the Toronto tower embodies civic pride and structural bravado, Alex Bozikovic explains.